It seems to me that Nora Webster has been very widely reviewed so perhaps there is not much more that needs to be said. If you have read Colm Tóibín before you have probably rushed out and got yourself a copy of this book as soon as you could, just like I did. And if you have ever had the pleasure of hearing Colm Tóibín speak you have probably read it with the lilt of his voice telling you the story, just like I did. And I can’t imagine anyone not loving this book, which speaks so eloquently of a widow’s grief and her courageous struggle to redefine herself in the wake of her loss. The book is set in the 1960s in Enniscorthy, a small Irish town not far from Dublin, a town with a claustrophobic atmosphere where everyone knows everything about everyone else, since birth. Opportunities are limited, especially for women, and Nora’s stay-at-home role means that for many in the town she is Maurice’s widow, not a person in her own right. She herself is not keen to go back to work but she has no choice: the widow’s pension is just not enough to bring up four children, and the small increases that come her way make her see in the politician who proposes them in a different light to the rest of her extended family. Adjusting to tedious clerical work and ghastly office politics is draining, and there is also her ongoing concern about her two young boys and their adjustment to the loss of their father, a teacher at the local secondary school. Her older girls are taking wing, which brings a new set of concerns, all exquisitely depicted through Nora’s perspective, in a family where silences prevail and people keep their thoughts to themselves. Nora, vacillating between wanting solitude and a new life, finds solace through music. There is profound pathos in the moment where she is lent a record of music that she loves, but has no record player to play it on. Mothers will smile in recognition at Nora’s mild resentment when her self-denial lapses and her ‘extravagance’ with the new record player is appropriated by her son playing pop music. Other small extravagances ‘grow’ the new Nora: a new hairstyle, a new dress, some high heels. Slowly she begins to make decisions without thinking about what Maurice would have said and done; slowly she begins to take pleasure in the company of people who are her friends. It’s not a dramatic novel. 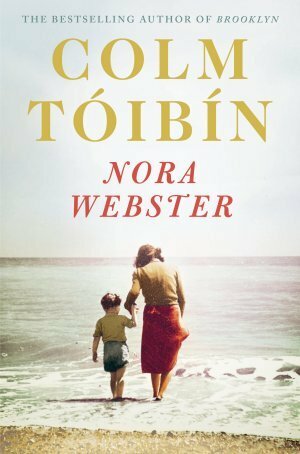 Unlike Tóibín’s powerful early novels (I’ve read them all) and the dramatic tension of The Master, Nora Webster is like Brooklyn (see my review) in tone and written from the female point-of-view, tracing the limited lives of women in Ireland yet revealing their emotional depth and domestic power. (He did the same, in a different place and time, in The Testament of Mary (see my review). Nora Webster is written in Tóibín’s characteristic plain style, the plot revealed in chronological order with only rare and brief flashbacks to fill in the details of Maurice’s death. Contemporary events are lightly sketched: Donal, the older boy, is desperate to see the moon landing, and the entire family is appalled by Bloody Sunday across the border in Derry, though divided in how to respond to it. They represent, in microcosm, the Irish response: Nora’s daughter Aina follows her father’s history with Fianna Fáil and urges action, while the extended family responds with caution torn by a sense of identification with the Catholics of Northern Ireland who are as Irish as they are. To see other reviews, visit The Guardian, the Sydney Review of Books, and the Literary Review UK. * A small quirk: on the verso page of this edition, the © title is printed as The Heather Blazing, instead of Nora Webster. Someone did copy-and-paste, and forgot to change the title! I loved this book and I’m glad you did too as other reviews I have read were not so glowing. Something about Toibin’s understated tone seems to take a hold of me when I read his books, and it doesn’t let go. I still remember this book vividly and I read it last year. Yes, it’s a ‘quiet’ book and that doesn’t appeal to everyone. But I find Nora memorable, as I found Ellis memorable. It’s just a beautiful book! I’ve only read The Testament of Mary and I loved it, one of my favourite books of 2013. Wonder if this would be a good second choice. When I read the synopsis, it sounded a little boring, not because it’s not plot heavy (I don’t mind that) but because I feel like I’ve read about these topics many times before… Brooklyn appeals more. *chuckle* You won’t be surprised to hear that I think you would enjoy both, but yes, I would read Brooklyn first. Nora, is in a way about a well-worn topic, but the setting’s time and place makes it different, and especially valuable for younger women to understand what pre-feminism life was like for so many. I too thought this was a very good read. Toibin’s writing style is one that allows you to enter the story, and sees things as they are, respectful of the characters in his novel. Nothing is forced onto you. I enjoyed it but found the 3rd person limited narrative frustrating, I wanted to get outside of Nora’s head and see things from another perspective. It stimulated an interesting discussion on my blog as many could really relate to her, reminding them often of their own family members, this to me was as fascinating as the book! I listened to a wonderful interview he gave about the book too, I think he was sitting at his desk, very comfortable and talking about the process, such a natural talent and a great listener, he catches every thought of his character by paying such close attention. Inspiring. I think he must be a close observer of women, to get inside their heads so well. LOL isn’t it interesting how cliché is sometimes just life as it really is. I wonder if the reason he left it so late to write this novel rather than get it off his chest in a debut novel, is because he had to wait until some ‘characters’ were dead? Brooklyn is said to be autobiographical in origin too. I think it was probably more a case that it was too painful to write and time had to pass to allow him to process what had happened. Is Brooklyn really autobiographical? Not heard that before.